Who is Early Support for? Cambridgeshire young children – aged up to five – who have significant and complex additional needs or disability and who need specialist support across education, health and care. 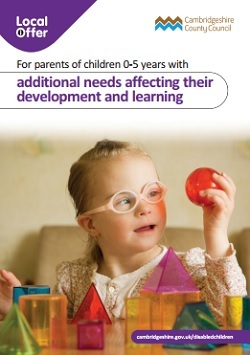 This includes children who have great difficulty communicating, have sensory, learning or physical difficulties and/or complex health needs. There are three Early Support Coordinators across the county – contact your local one for more information, help and support. Read more about Early Support on the county council website. These four leaflets have recently been produced by parents and professionals for parents/carers of children 0-5 years with additional needs. Mum Rachel says: “A great free of charge playgroup for pre-school children with additional needs. Would highly recommend this play group. “I’ve been taking my daughter since she was one. Although it’s a ‘stay and play group’ you leave your children in the room (if they are ready for that) whilst you get to go have tea (and cake if you like)! with the other parents as your children are playing. Great place to meet like minded parents and swap stories and support one another.